Given an unsigned integer, how would you count the number of set bits (that is, bits = 1)? This is an instruction, in ARM64 Assembly (AArch64), that performs the population count operation in one line of code. A similar instruction exists in most CPU assembly languages. iPhones use ARM-family chips. For example, my iPhone 6 uses an Apple A8, a System-on-a-Chip (SoC) built around an ARM64 CPU. The app is written in Swift but uses C and Assembly for the bit-counting operation. Calling ARM64 functions from Swift is a lot like calling a C function from Swift, so I wrote a C popcount() function to use with the simulator (compiles into x86 assembly) and an ARM64 popcount() function to deploy on the iPhone itself. The function is defined in the two files popcount.c and popcount.s. They use the preprocessor flags #ifdef __arm64__ and ifndef __arm64__ to tell the compiler which code goes with which platform. Both files utilize the same header to declare the function. You can create a header called popcount.h using the File menu. But this is a Swift project, so we need a bridging header to make the functions callable from Swift. A bridging header is created automatically if you carefully follow the prompts when creating a C file, but you can create one manually if need be. Compiling this code manually will show the assembly code generated by the swiftc compiler. I used this command: xcrun -sdk iphoneos swiftc -emit-assembly -target arm64-apple-ios11.0 SimpleFunction.swift. It produces a very large assembly file, not all of which needs to be replicated in the popcount.s code. The code starting at the function label and ending with the ret statement is useful, because we can use it to create our own function in assembly. adds is an opcode, a single basic instruction in assembly. Assembly opcodes typically perform a simple math operation on one of a few built-in variables. They may also move a word of data in or out of memory. This opcode adds two numbers together, respecting the sign bit. x0 is the destination variable for the operation, where the results are written. These variables are called registers in assembly, and they live on the CPU outside of memory. There are only 31 general-purpose registers on modern ARM chips, so assembly programs spend a lot of code moving data between memory and these local registers. x0, x1 are the source registers. The code that came before this command takes care of pulling the values off of the call stack (placed there by the calling function) and putting them into registers. There are a lot of other ARM64 commands, and a lot of details needed to understand function calls. But I won’t need to dive this deep to complete my task. dup duplicates an element (copies it). We are copying from a general-purpose register, x0, into a specialized SIMD register, v0.2d. v0.2d is a 128-bit SIMD register. x0 is a 64-bit register, so the .2d modifier instructs the assembler to duplicate x0 and put the two 64-bit copies into v0. This isn’t necessary for our purpose, but it is useful for other algorithms. 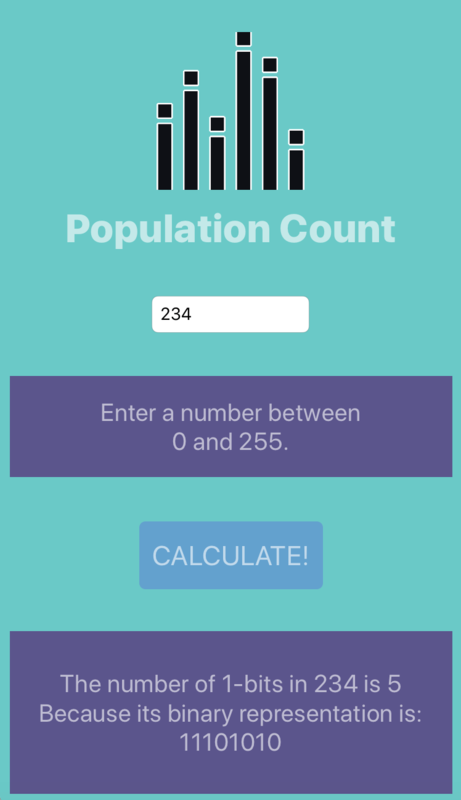 cnt executes the population count, replacing the bit pattern with the number counted. For example, 01101101 would become 00000101 (101=5, because there were five bits set in the data before the operation). v0.16b indicates the same register as before, except this time the SIMD register is being divided into 16 lanes, each 1-byte in size. Each of the 16 8-bit lanes inside the vector is treated as a separate register and they are all executed in parallel. Vector instructions like to perform one operation on many pieces of data in parallel, hence SIMD: Same Instruction, Multiple Data elements. fmov moves data between registers again, this time putting the results back in x0. The f here actually makes this a floating-point instruction, because FP and SIMD instructions share the same registers in ARM64. But it doesn’t make this a floating-point number. v0.d is once again the same SIMD register, but with a different way of splitting up the data elements. The d indicates that a double-word (64 bits) is being copied out of element 1 of the SIMD register. This puts the results into our GP register. Note: CNT only works in 8-bit chunks due to hardware limitations (more bits = more wires = less room to implement other features). If I wanted to support values larger than 255, I could add an addv command, which adds the 8-bit chunks together. There are many more ARM topics I have not explored. If you’re new to assembly language, it is worth noting some oddities of the assembly language environment. Assembly language gives you complete low-level control over the behavior of your CPU, but this means that understanding the details of CPU architecture is essential to writing efficient assembly. Instructions that rely on shared resources can create delays. Memory loads take several instruction cycles to complete. Compilers are pretty good at allocating registers and scheduling instructions. It may be worth writing code in C and using the generated assembly as a starting point to see how it can be done. There is a lot more to writing effective assembly than just knowing the syntax of the language. You can find lots of resources for learning ARM64 assembly. A crash course in ARM64 assembly might be a good place to start, and the ARMv8 Instruction Set Overview is both authoritative and exhaustive. Github member Richard Ross has written an entire iOS app in assembly. You can practice ARM64 using QEMU, which, although it requires a lot of effort to set up, will let you analyze assembly instructions one-by-one as the execute.